Sjaak Lucassen Arctic Super Bike Challenge with as a final goal, ‘North Pole’. Discussion in 'Trip Planning' started by Sjaak, Nov 29, 2016. After decades of traveling to all reachable corners of the world on sports bikes, I am now going for a less common one, the North Pole. I intend to periodically post updates on the project planning and preparation progress here. F650Dakar_Norway, OnOff, scottdc and 5 others like this. F650Dakar_Norway and Sjaak like this. now you have got me thinking, I too am interested in riding in the beautiful landscape and sheer hostile environment of the Artic. The experience would be too good to pass by. Perhaps I could build Artic 2 and join you in this endeavour. Is that actually you towing the sled trailer? If so what did you carry in the trailer? What did you have in mind for traction? The wide rear tyre makes good sense and all, im assuming the use of some pretty serious studs too? what is your experience and what are your ideas for bike adaptation? Did you ever fall through the ice while riding ontop of the sea or lake? I'm thinking his tires are going to be wide , very low pressure and cut like ice racing tires, no studs needed. Canadian built rolligons (spelling?) used them years ago. Sjaak and thewildcallsjon like this. Only I will be on a bike during the trip. Building a bike takes years. Unless someone brings in enough cash. But I will have support. Not to help me, I will do all myself, but to be a guide, carry fuel and for filming and photography. Also there will be the option for people who are interested to buy them in for a certain stretch or time. On my website you find most answers on you questions. www.R1goesExtreme.com Go to the North Pole Section. Also in the Adventure section under 2013 Polar Ice Ride you can find more info about my previous adventure. Just let me know if after that you are still interested in joyning. For the rear I bold 2 tyres together and put a new tread over the whole width. That sounds amazing, good luck on your trip. Wouldn't a 3 legger make more sense though? then you would not need to be so concerned about tip overs. 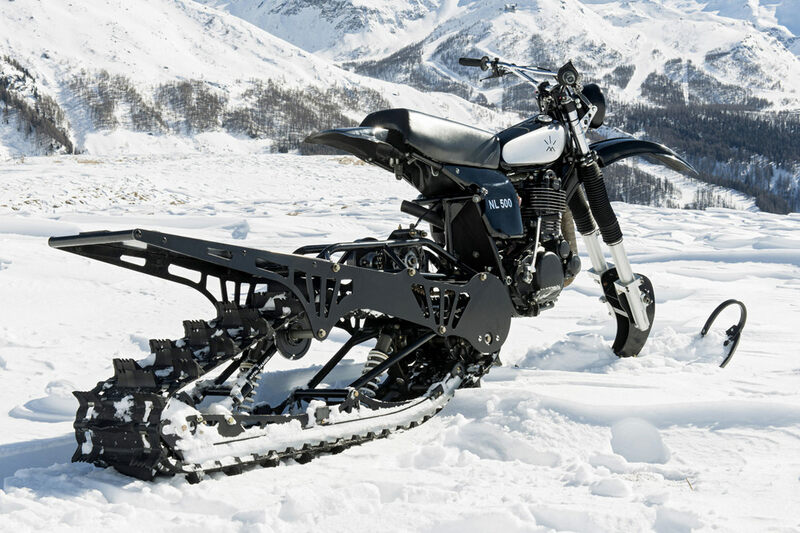 The wide tire on the back seems like a lot of extra work for limited gain, why not go with a modified snow bike design, then you will be sure not to get stuck someplace. Is your goal to reach your destination, or is it to ride a sportbike up there as far as you can? Guatemala City, Guatemala, and going down! Madness! I love it. Rooting for you from Colombia. I too think this is madness - though every part of me wants you to succeed! Salt Lake City - UTAH! Your original adventure vids rock! Good luck on this amazing challenge! Which north pole are you planning to ride to, the geographical north pole, the magnetic north pole, or the town of North Pole in Alaska?